I have lost count of the number of times I have watched the film version of The Sound of Music. I have never had the privilege to watch it on stage at the theatre. Until now, that is. 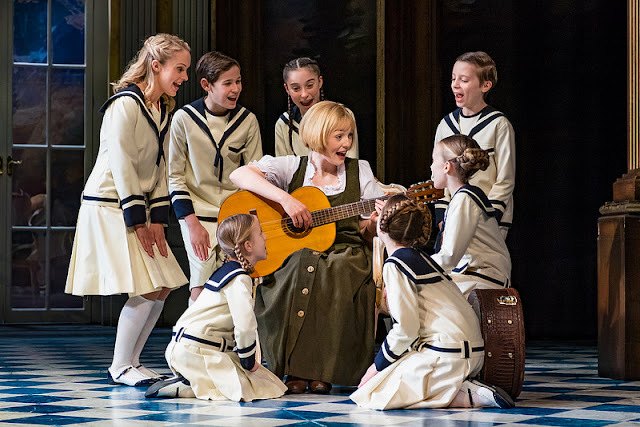 A brand new production of The Sound of Music is currently on tour and I was lucky enough to catch the show at The Lowry where it is currently playing. And so for the second time this week, the C-household headed over to Salford Quays to watch musical theatre. It takes something special to fill Julie Andrews' shoes. Lucy O'Byrne managed it with aplomb. The runner-up of The Voice UK has an endearing stage presence and exquisite vocals that had even my 4 year old son spell-bound. She has that cheeky innocence about her that we have come to associate with the character of Maria. 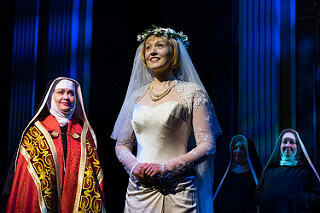 Jan Hartley as the Mother Abbess was sensational. Her voice quality is phenomenal and when she hit those high notes, I was covered in goosebumps. All the child-actors playing the von Trapp children were, without exception, absolutely fantastic. It is no mean feat to deliver not just lines but also vocals, with enough conviction to capture the imagination of a 1000+ audience. They managed it to perfection. Stand out for me was the little girl who played Brigitta. She has lines not previously seen in the film that portray her as a very intelligent and observant little girl who is not afraid to speak her mind. Something most 8-10 year olds and their parents will identify with. I hate to say this, but I felt a little let down by Gray O’Brien. Accomplished though he is as an actor, his Captain von Trapp had none of the stern charm that Christopher Plummer brought to the role. His portrayal seemed more relaxed, almost jovial. That could be his interpretation of the character, fair enough. But I missed the strong chemistry and passion between the lead characters, especially in the scene where they dance the Landler. Vocally too, he was a tad overshadowed by the rest of the cast, though you could see he really was trying very hard. Another interesting twist in the plot - Baroness Schraeder portrayed by Isla Carter is not the conniving Machiavellian villain we remember from the film. She was rather lovable, especially when she broke into song a couple of times. More so when she left a house full of noisy children and made her way back to Vienna to be a socialite! The rest of the cast put in a stellar performance and were very accomplished in their roles. The sets were so beautiful; it was amazing to watch the stage being transformed within minutes. There was a spontaneous sing-along during the interval when the live orchestra were playing tunes from the production and the audience simply joined in. It made the evening extra special. I will not dwell on the storyline; I refuse to believe there is anybody in the music-loving world that does not know it. All I can say is this. Do watch The Sound of Music in theatre at the next available opportunity. If you happen to be in the North of England over Christmas, head over to The Lowry where it is playing till 2nd January. And do take your children with you. My son is only four and a half, but sat through the show and has since been singing do-re-mi with me every day. I could not have asked for a better induction into music. Disclosure: We were given tickets to attend a performance of The Sound of Music. All opinions are my own. I think my son would be a good age for this. I like the fact that they've interpreted the story differently to the film - that shows confidence. Sounds like a fantastic performance. This sounds amazing. I absolutely adore the film so I think I would enjoy this. There was a version on TV last night which was good. This sounds amazing, I can't wait to take Boo to things like this when she gets a bit older.